Quite a few years ago (four!! 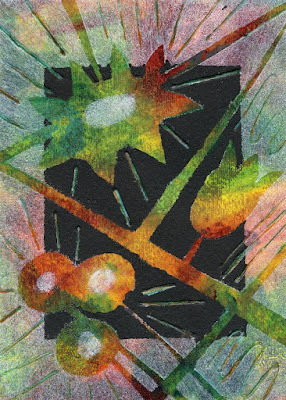 ), I painted this piece of watercolor paper, shown below, to use as a background for a future project. 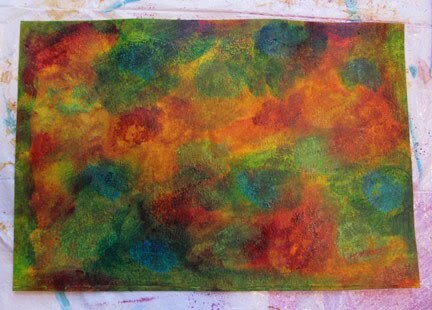 Finally, finally, the right idea came together with this bright and fun acrylics and rubbing alcohol paper. 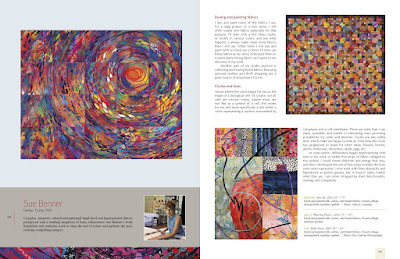 Take any background paper you have with a bright, busy pattern and good contrast. I took my inspiration from Jo Toye's wonderful book Abstract Explorations in Acrylic Painting, a technique that involves multiple gesso applications over masks. I will have a review of the book up soon. 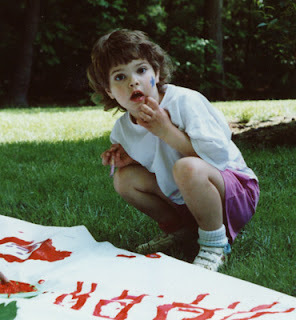 The first step is to tape down your masks (the flower shapes and large lines), and to roll on thinned white gesso. Then the outer rim is masked and the inside shapes of the flowers, and the rolling is repeated with black gesso. Roll off the resist with your fingers. I was a bit too ambitious this time with my oldest granddaughter. I thought it was a good time to teach her how do make a simple hand stitched quilt block, but the stitching part turned out to be too daunting. We'll set it aside and try it again in a year or so. Or maybe we'll start over. She loves cats, and my nickname for her is Kitty Kat, so this is what I designed for her. I encouraged her to choose unrealistic colors, and I gave her a wide variety of fabrics to choose from. We traced the pattern that I had made onto fusible interfacing and cut out the fused fabric pieces that way. She was a little careless with her tracing and cutting, so some of the pieces turned out a bit wonky. That's ok...that's how we learn! 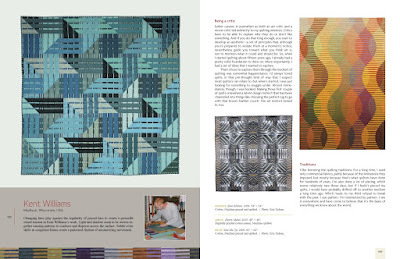 Schiffer Publishing has put out a book of unsurpassed beauty and inspiration for those who love quilts and quilting. 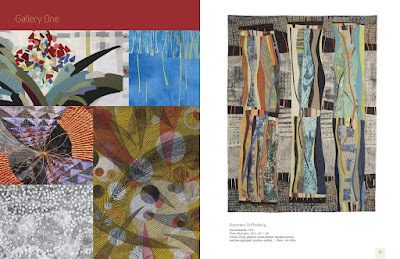 In their new volume, Art Quilts International: Abstract & Geometric, edited by Martha Sielman, you will find 220 pages of gorgeous quilts and the stories behind them. 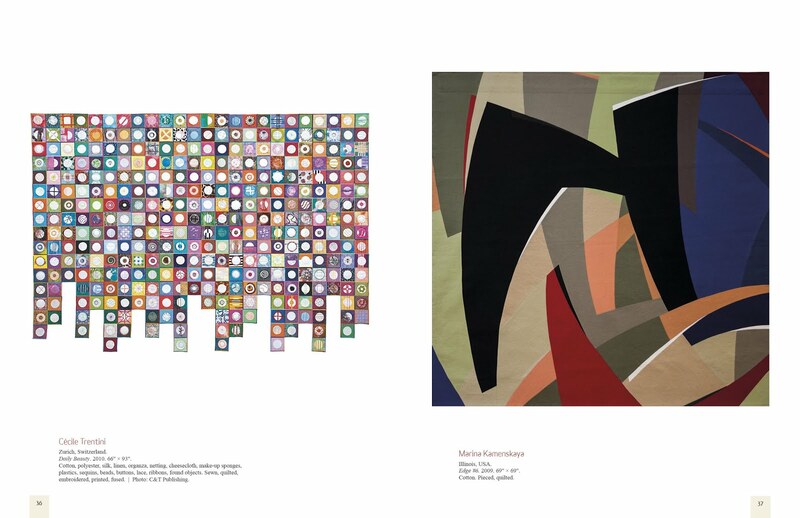 Martha, who is the director of Studio Art Quilt Associates, Inc (better known as SAQA), was able to chose from among 1300 submissions to 97 artists that are featured in the book's galleries, and 29 that are featured with information on their inspirations, working methods, and histories. The variety of styles represented in this large volume is incredibly inspiring. For anyone who has ever wondered what makes a quilt "abstract," the answer is manifold. Some focus on line. Some focus on color. Others merge those elements with symbolism. There are quilts that are monochromatic but with intricate quilting patterns. 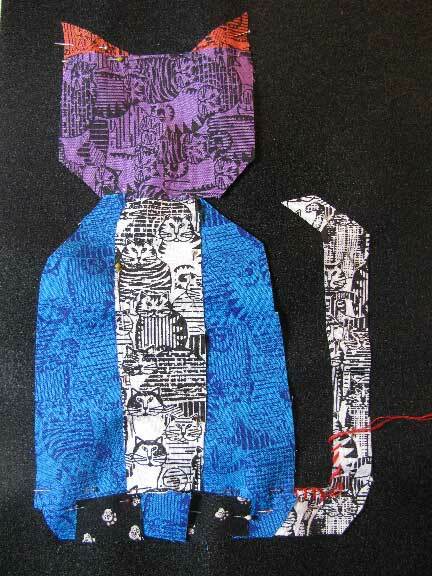 There are others that are wonders of patchwork piecing with very simple quilting patterns. Store bought fabrics? Hand dyed fabrics? 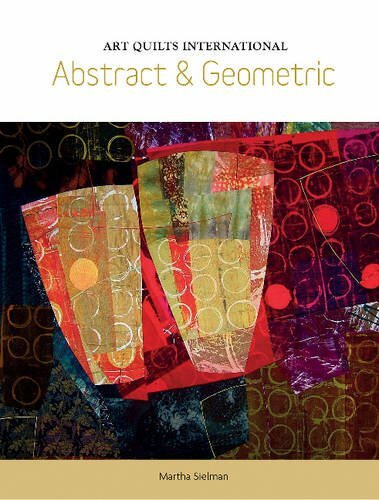 Surface design and printing? Whole cloth or patchwork? Yes yes yes...all of the above. 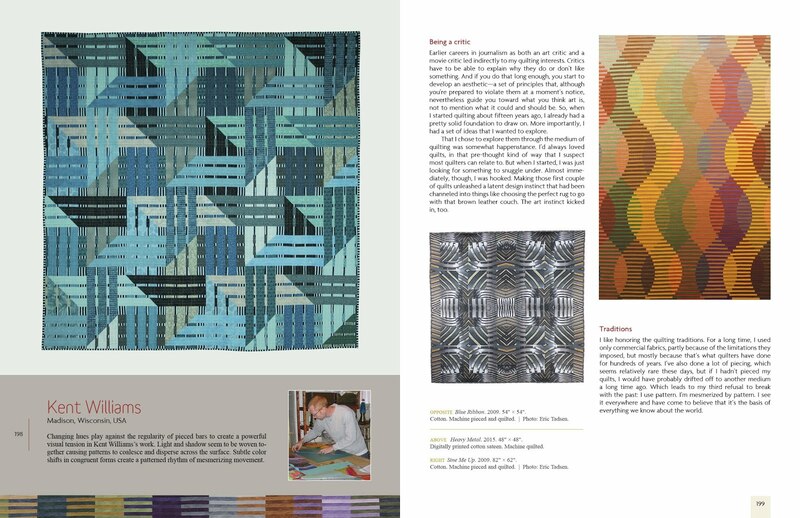 My personal preferences are split between purely geometric quilts that utilize lovely fabrics and textures, and abstracted from nature (or other images) quilts that use the real world as inspiration but do not slavishly copy it. 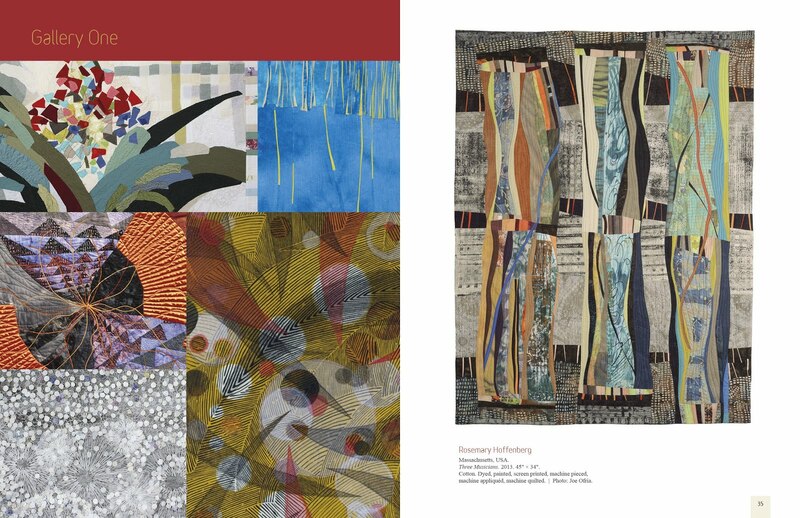 But oh, there is so much more, with artists who take their inspiration from just about anything you can think of, even including older traditional quilting and fiber art styles. If you are a quilter or a fiber artist, or even a collage artist, I cannot imagine that you wouldn't find this book to be a garden of delights! 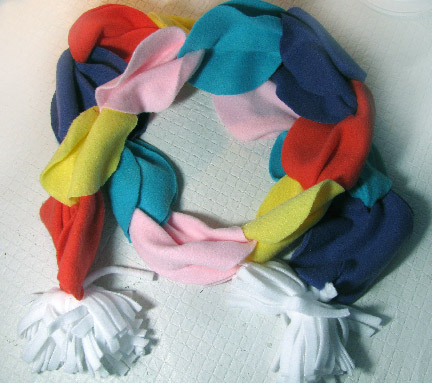 I found this super-cute scarf project before Christmas and was able to help my granddaughters to make two of them. Since the little one is only 3, I decided to cut out the pieces for both of them and just have them do the assembling. I know the older one could have helped with the cutting, but you know how that can go when there is sisterly competition involved! Anyway, to see the instructions, you need to visit The Decorated Cookie on Facebook. She has a quick and easy-to-follow little video there which shows you how to prep and assemble. 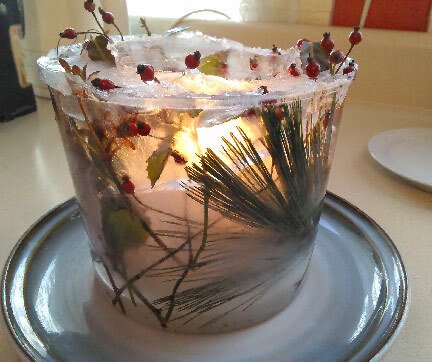 Over the Christmas and holiday break, my granddaughters and I were able to do several fun projects together. They both like a bit of instant gratification, but they are also able to wait a bit if the wait is worth it. With these ice lanterns, it was definitely worth the wait! First we took a little walk around the yard to gather up some pine greenery, some rose hips, and some holly. Then we took a large plastic container that I had saved, along with a plastic cup nested inside, and arranged the plants between the layers. After that, we simply poured in water that I had boiled and cooled ahead of time. Oh yeah, we also added pie weights to the inner cup, because, well, it wanted to float away! Science lesson too...score! My thanks to Creative in Chicago for this great idea!